This Lladro piece is a porcelain figure of a family of penguins gazing down lovingly at their newborn chick. Finished in a gloss glazed, hues of black, brown and white porcelain are combined to create these realisitic yet adorable beings. Truly portray the strong bond of a family. 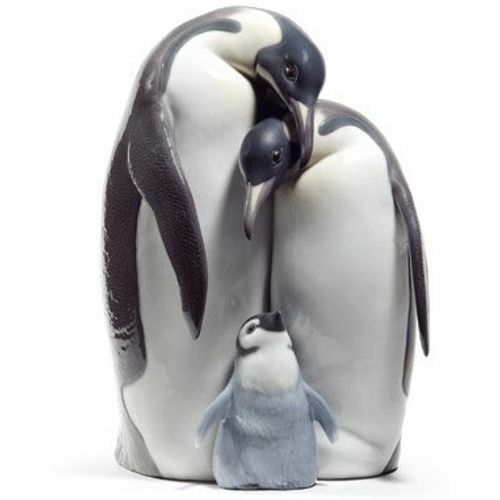 Ideal as a gift for all Lladro collectors and animal and penguin lovers in particular. Lladro Porcelain is produced by Artisans in Valencia in Spain. Lladro is made for memories, these beautiful classic and timeless creations make the perfect gift for all those special occasions throughout the years and make wonderful keepsakes for family & friends to treasure. Each piece is lovingly handmade and hand painted & comes with their unique Lladro markings by the Valencia Artisans. The Lladro Penguin Family comes presented in its Lladro presentation box & a certificate of authentication.